Archaeologists consider the corridors and chambers of the Great Pyramid in relationship with its structural development. The entrance to the core of the Pyramid is in the north face, at a vertically measured height of 55 feet above ground level, and it is situated almost exactly midway across the face. From the entrance, a corridor little more than 3 feet square descends into an unfinished chamber at an angle slightly more than 26 degrees. A square pit is sunk into the trenched floor and the rough walls of the chamber resemble a quarry. The south wall of the chamber contains an unfinished opening to a blind passage. The presence of this passage leads archaeologists to believe that if the original plan had been completed there would have been a second chamber beyond the first and interconnected with this blind corridor. When Herodotus visited Egypt during the middle of the Fifth Century B.C. he was told that beneath the Pyramid, vaults were constructed on a type of island which was surrounded by water channelled in from the Nile. On this island the body of Cheops was said to lie. However, no trace of this has yet been found and archaeologists think it unlikely that it ever existed. A somewhat more plausible alternative theory concerning the corridor and the unfinished chamber is that it was purposely left empty and unfinished to deliberately lead robbers to believe that no wealthy Pharaoh had been buried in the Pyramid. This is somewhat substantiated by another shaft leading to the descending corridor about 60 feet from the entrance of the unfinished chamber. This shaft could have served as a secondary maze to further confuse future plunderers. However, the most accepted theory is that this shaft was used as an air vent for the workers in the unfinished chamber. Sixty feet into the descending corridor is the opening to the ascending corridor which corresponds in width and height to the descending corridor. The ascending corridor is approximately 129 feet in length, and its slope agrees with that of the descending corridor to within a fraction of a degree. Where the ascending corridor and the descending corridor meet, three large blocks made of granite and placed one behind another, plug the entrance into the ascending corridor from the descending corridor. These three granite plugs may possibly have had scores of limestone plugs behind them. Arab historians record that in the Ninth Century B.S., at the command of the Caliph Ma’mun, son of Harun al-Rashid, of Arabian Nights fame, the tunnelers redirected their digging when a slab of limestone, fashioned so that it was indistinguishable from the remainder of the roof near the upper end of the descending corridor, collapsed. It was during this retunneling procedure that they encountered three six-foot granite plugs beyond which was a passageway plugged with several limestone blocks. The peculiar fact about these plugs is that they would fit just as tightly the depth at the upper end of the passage as they did the lower end. So great was the engineering agility and skill required to maneuver these granite blocks into place f that how it was accomplished still remains a mystery. Even more mysterious, however, is where these blocks were stored prior to the burial of the pharaoh or, if the blocks were placed before the interment took place, how the body was entombed with the plugs blocking the entranceway to the burial chamber. Many theories have been offered to explain these mysteries, all too implausible to be given serious consideration. To this day, the granite plugs remain in place, a mute testimonial to the genius of the Pharaoh’s architect. A chamber, built at the end of the passage from the top of the ascending corridor, and called by the Arabs “Queen’s Chamber” is calculated to be exactly mid-point between the north and south sides of the Pyramid, and directly under the capstone. The Queen’s Chamber shows indications that work was abandoned before completion. It measures more than 17 by 18 feet with a pointed roof rising to a height of over 20 feet. The east wall contains a niche 3Vi feet deep, 15 feet high and 5 feet wide, which was presumably designed to contain a statue which may never have been placed in position. The Queen’s Chamber contains two shafts with a dead end, one on the north wall and the other on the south wall. These shafts are thought to have been ventilating shafts much like the one for the unfinished chamber, but most probably were part of the maze system of tunneling used to discourage despoilers from reaching the king’s chamber. A third theory claims these shafts were for some astrological purpose used in the surveying process of building the Pyramid and chambers. The continuation of the ascending corridor at the 129 foot mark is in the form of one of the Pyramid’s most celebrated architectural works, “The Grand Gallery.” It is over a hundred feet long and nearly 30 feet high. Both walls of polished limestone reach a height of 7 Vi feet. At the foot of each wall a catwalk two feet high and l3A feet wide runs along the length of the Gallery with a passage 3 Vi feet wide between the catwalks. The Gallery was constructed with a slope of 26 degrees and was so designed as to create a cumulative pressure all the way down the roof, causing each stone to be individually held up by the side wall. At the lower end of the Grand Gallery a gap now exists, caused by the removal of the stones which formerly linked the floor of the passage with the ascending corridor, and also covered the mouth of the horizontal passage leading to the Queen’s Chamber. Removal of the lowest stone in the gap revealed a shaft which descends into the west wall of the descending corridor. A stone raised three feet from the floor located at the upper end of the Grand Gallery gives access to a narrow, low passageway less than four feet square leading to the King’s Chamber. About a third of the way along this polished limestone passageway enlarges into a sort of ante-chamber of polished red granite. The passageway then continues at its original aperture of less than four feet square opening into the King’s Chamber. The King’s Chamber is completely built of polished red granite blocks, measuring slightly over 17 by 34 feet wide and 19 feet high. In the north and south walls, there are shafts similar to the ones found in the Queen’s Chamber and the unfinished chamber. These shafts apparently at one time penetrated the core of the Pyramid and reached the outer surface. Near the west wall a lidless, rectangular granite sarcophagus stands. Egyptologists vehemently insist that this sarcophagus contains the king’s body, which was probably enclosed within an inner coffin of wood. The mystery of the sarcophagus is that its width is 1 inch greater than the width of the ascending corridor. Because it could not have been brought through that corridor, archaeologists conclude that it must have been placed in position while the chamber was being built. There appears to be no exact architectural parallel to the roof and flat ceiling of the King’s Chamber. Its flat ceiling of nine limestone slabs weighs an approximate total* of 400 tons. Three more ceilings of exact construction are separated by compartments; the fifth and final ceiling is pointed. It is thought the purpose of this particular construction of the roof was to eliminate any risk of the chamber’s ceiling collapsing under the weight of the surrounding superstructure and the forces of nature. Their construction has been justified because every one of the massive slabs of granite in the ceiling including those in the relieving compartments are cracked, presumably by earthquakes, and yet none have collapsed. It is thought that The Great Pyramid was first violated by plunderers during the beginning of the First Intermediate Period, somewhere within the Seventh Dynasty. 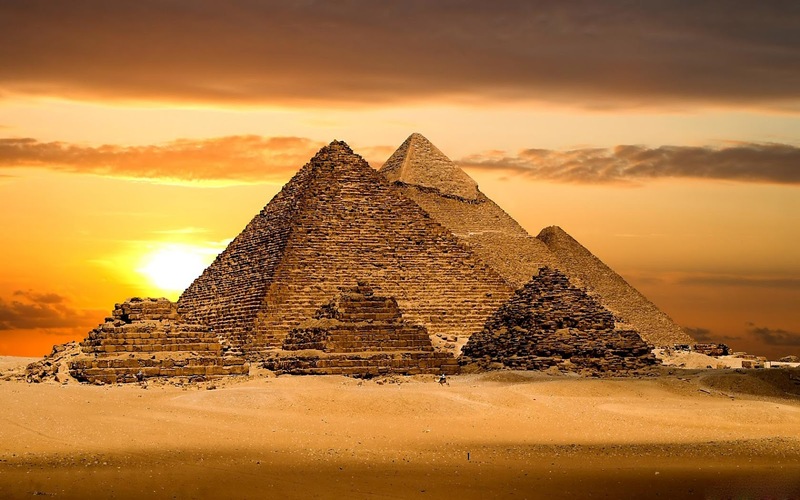 Several other violations appear to have been perpetrated, and each time the Great Pyramid was renovated and the entrance concealed. These security measures were to cause archaeologists, centuries later, great difficulty in gaining entry to the Pyramid.